Hyderabad City Police Recruitment 2016 Notification released for 1800 Home Guard Posts 2017. Apply online for Hyderabad City Police Jobs. 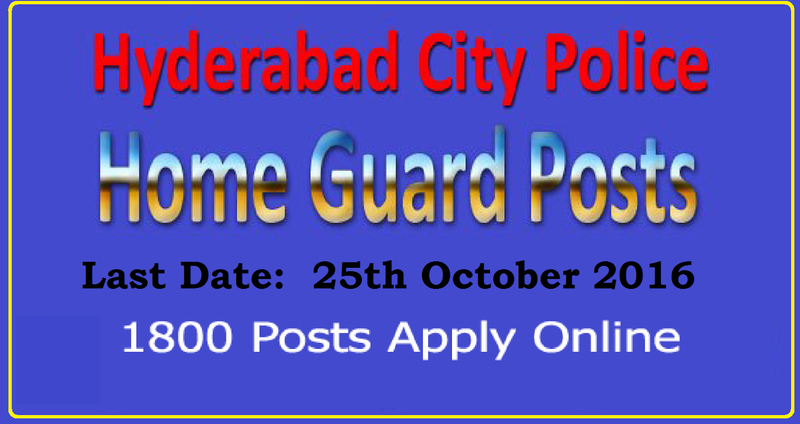 Hyderabad City Police Recruitment 2016: Hyderabad City Police Department recently depicted a employment notification of Hyderabad City vacancy 2016 to hire the applicants on the posts of Home guard jobs . According to the Hyderabad City jobs 2016 is conducted to fill up 1800 vacant posts in the department. The eligible & interested contestants can apply through the Hyderabad police website. The Competitors need to apply online in the home guard recruitment. The contestants will be selected through various selection rounds like physical efficiency test, physical standard test, & written exam etc.